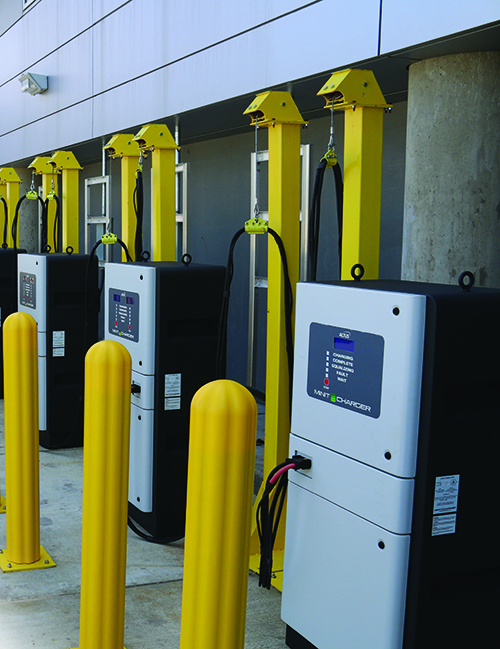 A project to install 27 electric charging stations at Birmingham-Shuttlesworth International Airport (BHM) is among the recent examples of the ongoing shift to zero-emissions fleets of airside vehicles such as baggage tugs, belt loaders and pushback tractors. The Alabama airport installed 13 dual-port chargers and one single-port charger to support electric ground service equipment purchased by Southwest Airlines and Delta Air Lines. The charging stations and supporting infrastructure, installed in 2016, are located on concourses A and C.
Each dual-port charging station cost $38,500; the single-port stations cost $13,000 per unit. Additional costs, such as cable management systems and racks to mount the stations in, brought the total project cost to about $1 million. Fully 90% of the cost was covered by an FAA Voluntary Airport Low Emissions (VALE) grant; BHM paid for the remaining 10%. Established in 2004, the VALE grant program supports sustainable projects within EPA designated “non-attainment” counties that help reduce emissions at U.S. airports. The staff at RoVolus has assisted BHM with several VALE applications, and reports that the federal program has awarded U.S. airports $20 million to $45 million per year for more than a decade. According to the FAA, airports are reducing ozone emissions by 478 tons per year through VALE-funded projects. That is the equivalent of taking 26,000 cars and trucks off the road annually. Southwest Airlines has access to six dual-port chargers and a single-port charger at BHM, and Delta has access to six dual-port chargers. The airport was able to receive the VALE grant because both airlines committed to replacing diesel-powered baggage tugs and belt loaders. Southwest still uses some fossil fuel-powered equipment at the airport, but plans to transition the rest of its fleet at BHM by the end of 2019, reports Adam Walters, the carrier’s senior environmental specialist. Normally, the FAA requires airlines to purchase new electric equipment for airports to receive VALE grants, but Thompson says the agency made an exception for this project because Delta was purchasing new equipment for ATL, and, relatively speaking, BHM is a smaller airport. United Airlines and American Airlines, which also serve BHM, did not participate in this phase of its project. But Thompson expects that the airport will work with both carriers to replace their diesel-powered ground service equipment in the future. Their lack of participation to date was more about the airport authority’s need to limit the scope of the project for budget reasons than disinterest on the airlines’ part, he explains. The airport authority’s $100,000 share of the $1 million project simply maxed out its budget at that time, notes Thompson. The 2016 charging station project is the fourth VALE- funded project that BHM has completed, and a fifth project has already been approved. The airport will use its next VALE grant to construct a compressed natural gas station so it can replace its current diesel shuttle bus fleet and one maintenance truck with vehicles that run on compressed natural gas. Thompson credits Darcy Zarubiak, managing director at RoVolus, for helping the airport authority secure most of its VALE grants. 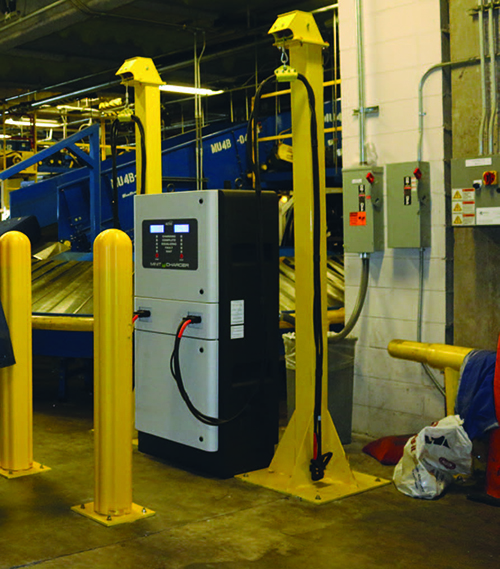 The airport authority tackled the application process for its first VALE-funded project (replacing gas-fired boilers in 2013) in-house and struggled to complete it. “Once we got Darcy involved on the next four projects, it just made everything so much easier and so much smoother. I don’t know how many more projects we would have pursued if we continued to try to complete them in-house,” Thompson reflects. Zarubiak advises airport managers on the optimal set of grants to use for various projects. In some cases, VALE grants are coupled with other funding, such as grants from the Diesel Emission Reduction Act to cover more of an airport project. Using various grants is an attractive means for accomplishing projects of all sizes, but the application processes can be cumbersome and time-intensive, says Zarubiak. He regularly tracks more than a half-dozen environmental programs and steers the application process on behalf of client airports. Zarubiak reports that U.S. airports currently have numerous VALE projects in the works. “They are motivated to do the right thing environmentally, but they face all sorts of time and money limitations,” he observes. “Sometimes the VALE money alone doesn’t make the project happen, or the VALE program is difficult to work with, so airports have reached out to other environmental grant programs. 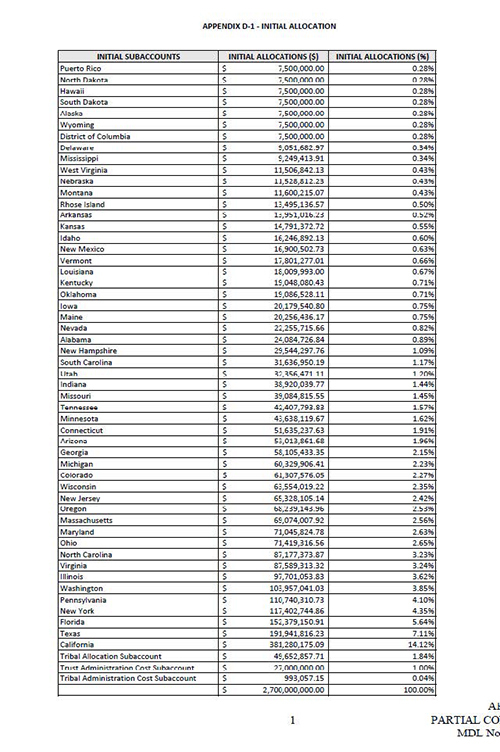 “By my last count, 63 projects around the country have received VALE funding,” he reports, noting that he played a role in applying for about 70% of those projects. 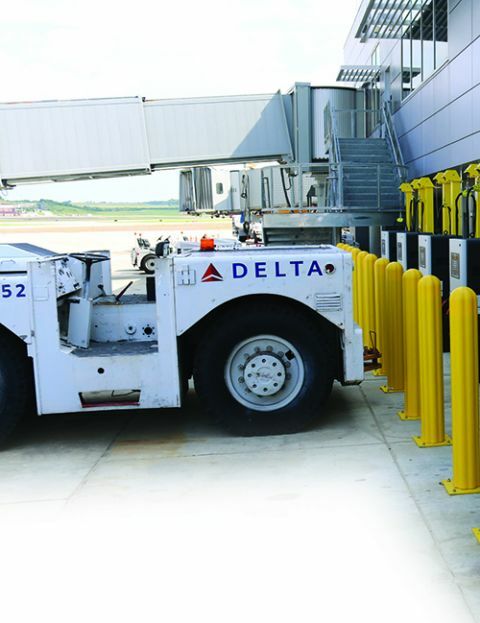 Even though airlines cannot receive VALE funding, they have plenty of incentive to coordinate with airports on projects like BHM’s transition to electric ground support equipment. According to Zarubiak, carriers can save up to $3,000 per vehicle annually by using electric vehicles, due to reduced fuel and maintenance costs. 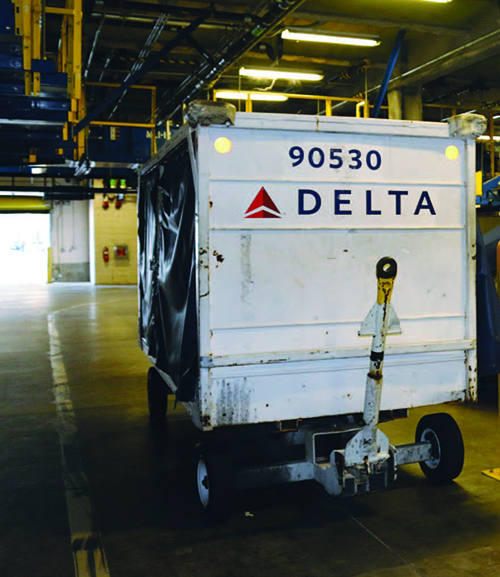 Beyond saving the airline money, the new electric equipment is a hit with ground service personnel, because they like working with equipment that is quieter to operate. “We have always had a position at Southwest that if an airport is able to install electric charging infrastructure, and the climate supports our battery charging practices, we’re going to do our best to convert that operation to electric,” he explains. Walters estimates that 20% of Southwest’s nationwide ground service fleet is electric. The airline tries to use electric vehicles at airports with warmer climates, because their batteries struggle to charge up and retain power during extended periods of extremely cold weather, he explains. As technology improves, though, Walters expects electric ground service equipment will eventually be able to work in most climates. While airlines aren’t eligible for VALE grants, they can receive other grants to help fund the conversion to electric ground service equipment and other environmental projects. But logistics associated with some of the awards can prove cumbersome. For example, DERA (Diesel Emissions Reduction Act) grants and funding related to the Volkswagen settlement can require airlines to pull the engines from diesel-powered equipment being replaced, drill a hole in each engine block and cut up the vehicles’ frames as assurance the vehicles are being removed from service. Contracting this work and transporting the equipment to a scrapyard can negate the cost benefits of a grant. As part of the settlement for its highly publicized emissions scandal, the U.S. division of Volkswagen agreed to pay more than $2.9 billion in fines to the U.S. Environmental Protection Agency (EPA). The EPA, in turn, created a trust to make that money available for projects that reduce harmful nitrogen oxide emissions. News broke in 2015 that for almost 10 years, Volkswagen had sold more than 500,000 diesel engine cars in the U.S. with devices that allowed the vehicles to meet EPA emissions standards during testing, but circumvent those standards and emit 40 times more harmful nitrogen oxide during regular use. The U.S. civil settlement calls for Volkswagen to pay $25 billion in fines and restitution, with $2.9 billion of that going to an Environmental Mitigation Trust. There are 12 different categories of mitigation actions the funds can be used for, and three apply to projects that make sense for airports, says Zarubiak. One category is specifically for replacing gas- and diesel-powered airport ground service equipment with electric vehicles. 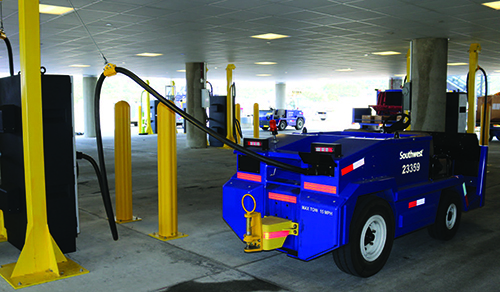 Another category applicable to airports is designated for replacing gas-powered forklifts, and the third category is to replace diesel-powered shuttles, transit buses and school buses. The FAA advises airport officials to identify the state agency that is directing the Volkswagen settlement money programs in their state and begin project planning. FAA personnel are working to facilitate these projects by helping obtain answers to questions, connecting key stakeholders and opening lines of communication between various aviation organizations in order to foster the use of Volkswagen settlement funds for aviation. Zarubiak says he understands that some airport managers are reluctant to divert resources and time to drafting and submitting requests for these funds. “It’s really hard to prioritize a program that no airport has ever seen,” he commiserates. But he also emphasizes that the amount of money available is much greater than the funds from grant programs that aviation professionals are familiar with. Also, because many airlines stand to reap significant savings if they can use Volkswagen settlement money to convert to electric ground service equipment, many have offered to help airports draft their proposals. Visit VWclearinghouse.org to view a resource for potential beneficiaries created by the National Association of Clear Air Agencies) and the National Association of State Energy Officials.